Thanking to Minister Özhaseki for being there on their happy and important day Hisarcıklıoğlu said followings: “He has been a brand in municipality since past to present. Now he has become the brand of urban planning and public improvements. He always stands by Turkish private sector. We are truly lucky to have such Minister”. Hisarcıklıoğlu said that Şırnak is Turkey’s window to the Middleeast and Habur Border gate which as TOBB they modernised contributes great deal to the exportation of Turkey. Hisarcıklıoğlu underlined that thanks to the efforts by Ministry of Environment and Urbanisation Şırnak, Cizre and Silopi have regained brand new appearance. 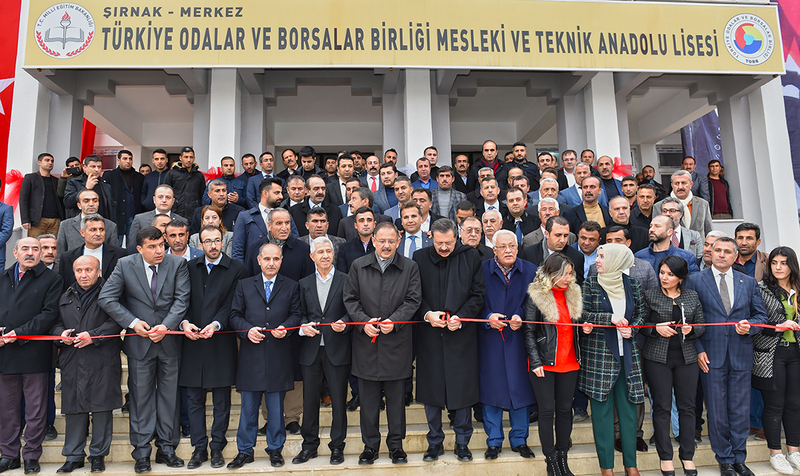 Stating that to enable Şırnak to develop more, they continue to invest Hisarcıklıoğlu said followings: “Here the most important investment area is education. As TOBB, we purchased this 117 thousand m2 ground for the construction of schools and lodging houses. Therefore 4 schools with 88 classroom capacity as TOBB Vocational and Technical Anatolian High School, Sports High School, Şükrü Geliş Science High Scholl and Imam Hatip High School have been built. Here also 2 lodging houses where 600 students in total can stay become operational. One of the schools that I previously mentioned, Science High School also came in operation by the courtesy of Şırnak TSO President Osman Geliş”. Minister of Environment and Urbanisation Mehmet Özhaseki also expressed his best wishes to Şırnak, to the country and nation for the new facilities. Özhaseki said "Older timers had a saying; man should leave an achievement behind, those who does not have an achievement shall be gone forever. We are living in a passing life. The important thing is to be able to achieve good works between these two periods of times. When a human being passes away his child remembers him the most, then his grandchild and finally he shall be fade away. If we do not want to be fade away we need to leave works, achievements behind.” and added that whatever service they provide for Şırnak the city of his holiness Noah, shall not be enough. Governor Mehmet Aktaş told that the most valuable investment is the one made to a person. Saying "If as the state and nation, we are still standing strongly and moving on despite all the negativity around us as, reached to the position of hope for the oppressed people of Islamic world is because we have hardworking, productive and educated generation who can interpret global world." Aktaş also underlined that schools region shall provide an opportunity for raising individuals who deeply experience sharp mind, loyal to the country, the flag, the language, the religion and the state.